Ojas Ayurveda is an authentic Ayurvedic wellness center offering Ayurvedic services like consultations, Panchakarma therapies (Ayurvedic detox),and various Ayurvedic healing therapies in an ideal environment. According to Ayurveda human being is a unity of body, mind and soul, and disorders emerge in case of imbalance or improper co ordination among body, mind and soul . Ayurveda believes each individual is unique. Ayurvedic therapies aim to bring back the balance .Our treatments are customized for individual and our therapeutic approach is scientific and logical. At Ojas Ayurveda we are committed to serve to achieve the best possible results. Sushma Jakkula has a bachelor’s Degree in Ayurvedic medicine and Surgery (BAMS) from India. She graduated in 2002 from NTR University of Health Sciences after successful completion of a five and half years of study in Ayurveda. She is a Certified Panchakarma Therapist. She believes in promoting health through a balanced lifestyle and natural healing with a mission to prevent illness, promote health, and offer natural healing through Ayurveda and Yoga. Sushma Jakkula has over 15 years of clinical experience in Ayurveda. Currently practicing Ayurveda in Tampa, FL. providing Ayurvedic consultations, therapies and Ayurvedic education. 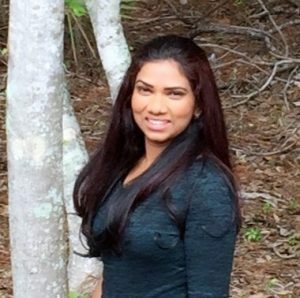 Sushma Jakkula is the founder and president of Ojas Ayurveda wellness center in Tampa, FL. * Founder and president of Ojas Ayurveda , Tampa, FL providing consultations, therapies and educational programs like seminars and work shops to promote awareness of Ayurveda. * Self employed, providing various Ayurvedic services like consultations, therapies, and Ayurvedic education. * Worked in Pumega Maternity and Surgical hospital located in Hyderabad, AP, India. * Worked in various health departments in Government Ayurvedic Hospital Hyderabad, India, such as General medicine, Pediatrics, ENT, Obstetrics and Gynecology, Toxicology, Geriatrics and Surgery.